MANILA, Philippines - The Commission on Higher Education (CHED) announced July 2016 the first batch of scholars to study at colleges and universities abroad. These faculty scholars will pursue their Masters' and Doctorate degrees in Asia, United States, Europe, among others. 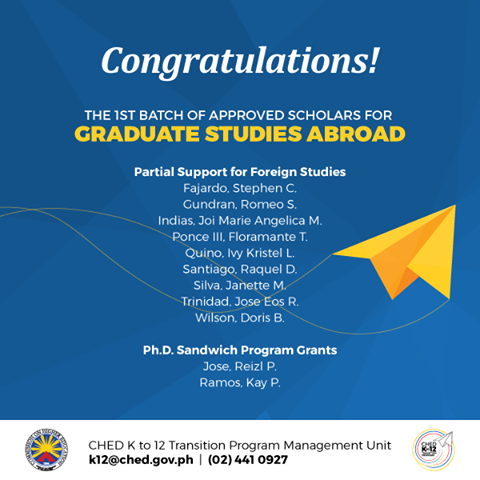 The first batch of awardees is part of CHED's 'Foreign Scholarship for Graduate Studies Programs' for faculty members and staff of Higher Education Institution (HEI) affected by the K-12 transition program. Here are the names of approved scholars to study abroad. Courtesy of the Professional Regulation Commission. The list and image above are courtesy of the Commission on Higher Education. Meanwhile, the application for second batch is already open. Interested applicants may refer to below related article for details. SEE ALSO: How to apply and what are the requirements for CHED Scholarship Abroad?